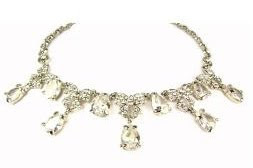 I’m sending my husband psychic messages to buy this Butler & Wilson necklace for me from Sparkle Candy. It’s on sale, so it’s only £25! So anyone who reads this, help concentrate the ‘buy me’ energy his way. It’s sort of like in Peter Pan when the audience has to applaud loud enough to bring Tinker Bell back to life. If you wish really hard, maybe I’ll get that necklace. Let me know what you want, and I’ll do the same for you.